Jamshedpur FC lived up to their early pre-season promise with a methodical 2-0 victory over Mumbai City FC in their Hero Indian Super League opener at the Mumbai Football Arena on Tuesday. In a fiercely-contested affair, Mario Arques’ 28th-minute header and Pablo Morgado's second in the fifth minute of added time proved to be the difference. It were the visitors who started the match in a much more confident manner and a move involving Jerry Mawihmingthanga almost paid off in the 10th minute. The Jamshedpur winger played a one-two with Memo before crossing the ball across the box. Sergio Cidoncha’s attempted bicycle kick failed to come off before Carlos Calvo’s shot was deflected out for a corner. The resulting set-piece saw Calvo find himself in a great position to score once again but the Spaniard blasted his effort over the bar. Mumbai were finding it difficult to make any real forays into the Jamshedpur box and the visitors deservedly took the lead in the 28th minute through a Mario Arques’ header. The Spanish midfielder’s attempted shot from 25 yards out initially found its way to Calvo on the left-flank. Calvo crossed the ball back across the face of goal and Arques, who had made a brilliant run, cushioned in a perfect header from a tight angle. Cesar Ferrando’s men almost doubled their lead immediately after the restart through a Calvo corner. An unmarked Tiri rose well to meet the excellently taken corner but his header was cleared off the line by Lucian Goian. Mumbai should have levelled matters minutes later following a midfield scramble which ultimately saw Sanju Pradhan thread a brilliant through ball between Jamshedpur’s two central defenders to release Rafael Bastos on goal. With just goalkeeper Subhasish Roy to beat, the Brazilian somehow failed to get a proper connection on the ball and the meek attempt was easily dealt with by the Jamshedpur custodian. Subhasish though, was required to be at his very best around the hour mark after Goian’s punted ball forward was flicked on to the path of Modou Sougou. The Senegalese striker’s perfect header seemed destined to nestle into goal before Subhasish pulled off an excellent dive to tip the ball over for a corner. Mumbai thought they had got their equalizer in the 77th minute after Rafique’s header from a cross from the left-flank beat Subhasish. Much to the dismay of the home fans and the coach, the goal was ruled out for offside. Another ‘goal’ in the 85th minute was again flagged for offside. There was a goal, finally, but at the other end. 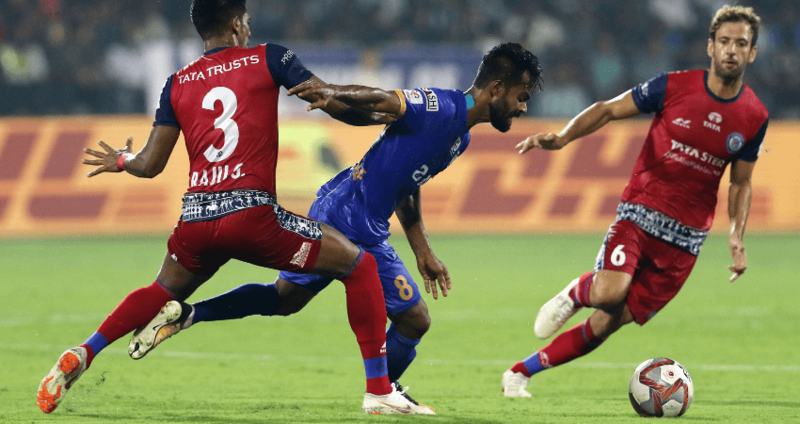 In added time when Mumbai pressed more men forward, a quick break saw Sergio Cidoncha release debutant Pablo Morgado Blanco down the right flank and the substitute sealed all three points for his side with a thumping finish which beat Amrinder Singh from a tight angle. A frustrating night for the Islanders but a lot of positives to take note of in the second half. Next up is a trip down south, as Mumbai City FC take on Kerala Blasters FC at the Jawaharlal Nehru Stadium in Kochi on October 5.